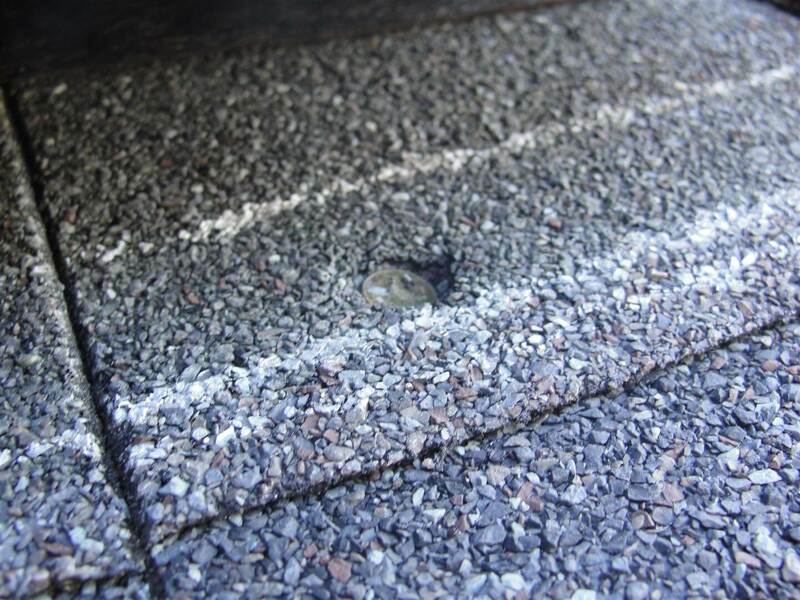 One of the most common defects I find with asphalt shingles is improper nailing. The manufacturers of asphalt shingles give specific instructions on how to fasten shingles, and they’re all pretty much the same. Unfortunately, following those instructions seems to be a difficult thing to do for a lot of roofers in Minnesota. 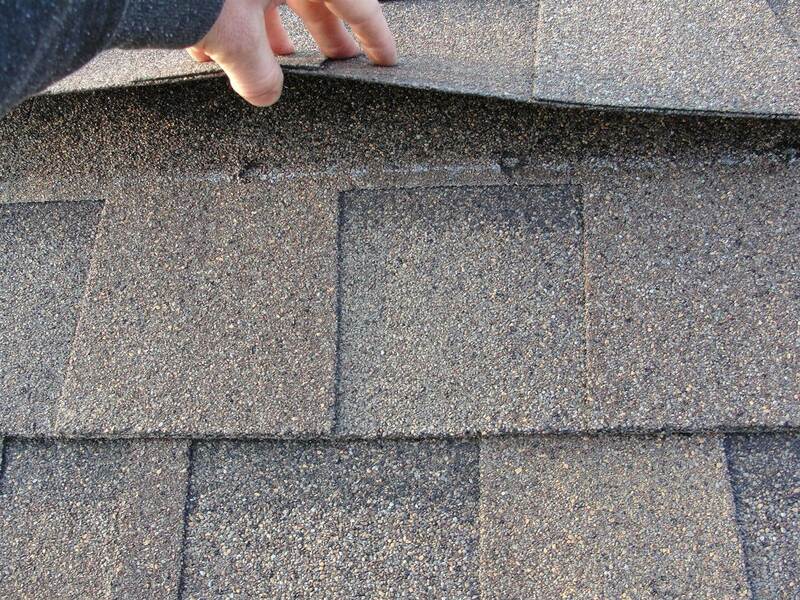 The two most common nailing defects that I find with shingles are overdriven nails and improperly located nails. Most roofers use pneumatic nail guns to nail down shingles. When the pressure is set too high, the nails get driven in to the shingles too far, plain and simple. When the nails are overdriven, the heads of the nails punch right through the mat of the shingle. 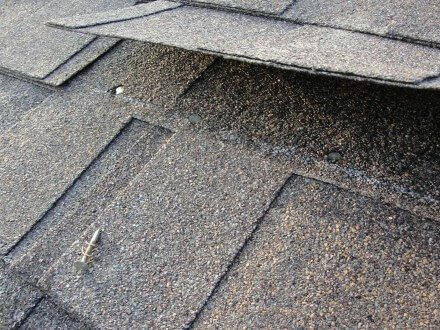 This voids the shingle manufacturers warranty and greatly increases the potential for shingles to come loose and blow off, possibly in sheets. The diagram below shows what proper and improperly driven nails look like. 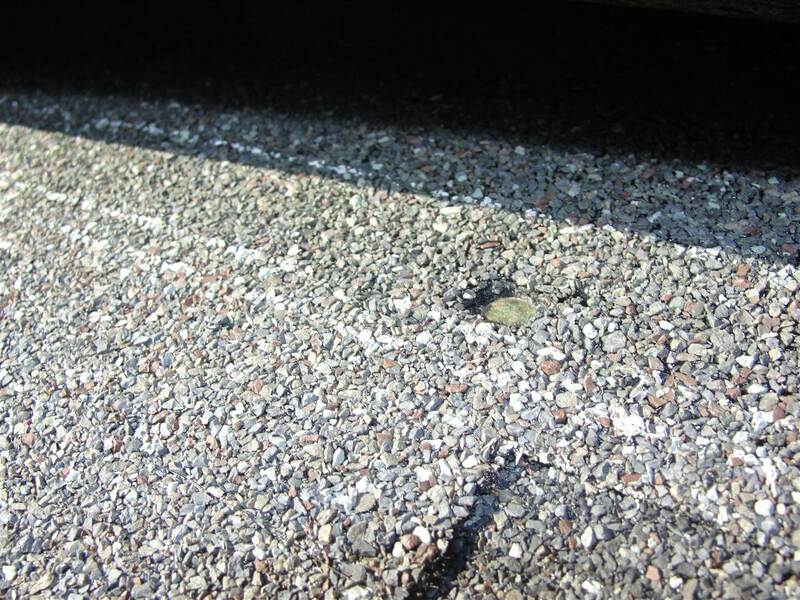 The photos below show several examples of overdriven nails. 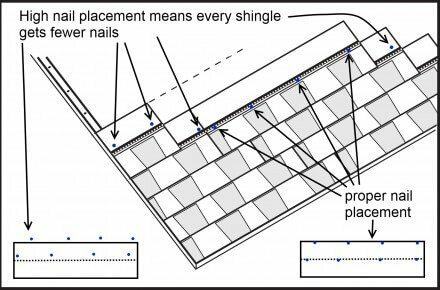 The other most common nailing defect that I find with asphalt shingles is improperly located nails; specifically, high nails. 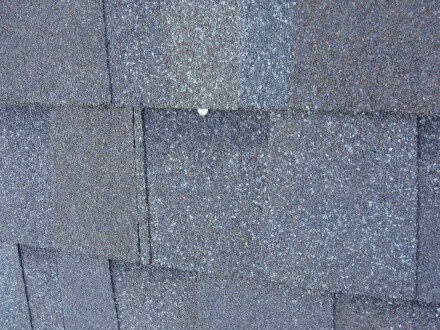 When shingles are located too low on a shingle, it’s an obvious defect that anyone with a good eye can usually spot from the ground. This is probably why I don’t find this defect all that often; it’s just too obvious of a defect for most roofers to leave uncovered. 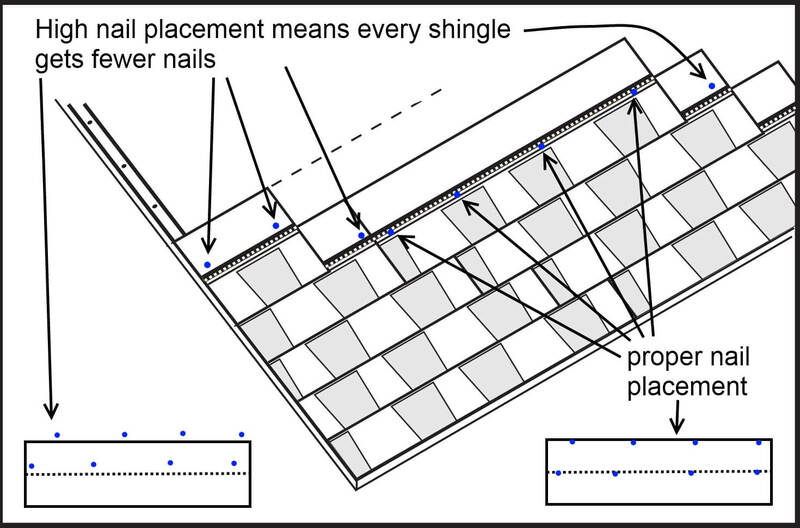 The more common and problematic nailing problem is to have nails located too high on the shingle. There is a fairly narrow strip on every shingle where it’s acceptable to place the nail. 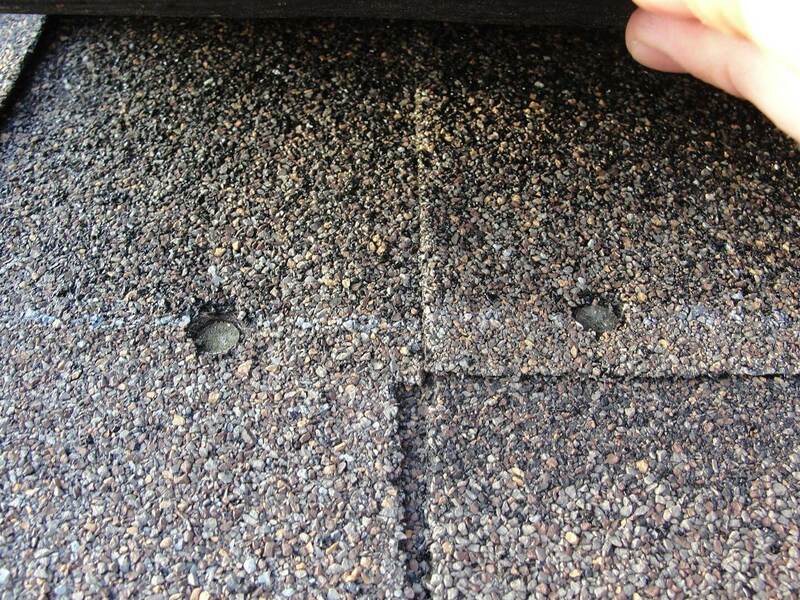 When properly placed, the nail will actually catch the top edge of the shingle below it. When nails are located too high on the shingle, they never catch the shingle below, which effectively cuts the amount of nails going in to each shingle in half. Hopefully my diagram below will help to illustrate this; the blue dots are supposed to be nail heads. The photos below show examples of high nailing. Yes, I know what I did there. When shingles are improperly fastened, they have a tendency to slide and rip out of the nails holes, and this won’t be covered by the manufacturers warranty. When the entire roof covering is installed like this, there is no simple fix. Either the new buyers need to accept the fact that their roof will be prone to having shingles blow off, or the roof covering will need to be repaired or replaced. These installation defects can’t be seen from the ground, even with a very expensive pair of binoculars. For this reason, you shouldn’t expect most municipal inspectors to identify these issues; it’s outside the scope of their inspection. 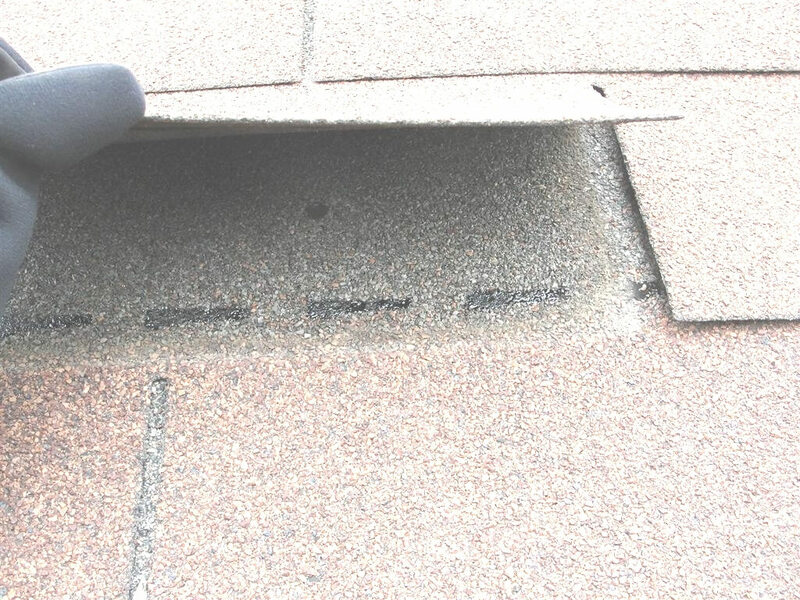 I wrote about this topic here – Who Inspected Your Roof? If you want a thorough roof inspection, you would do well to hire a home inspector who will access the roof. I have a “new” home that was built in Spring 2008. The roof is GAF Timberline HD Prestique 30. A lot of the shingles were high nailed. I have had continued problems with a large area that was nailed by a particular man using a pneumatic nail gun. The roofer has not cooperated with me. I’ve had multiple blow offs since installation. Here is my question. If the shingles are nailed high how common is it for wind to break the seal. On other words, would the shingle, although initially sealed, be more apt to lift from winds, say 40 to 50 mph? Here is another question. If a shingle is high nailed will it be harder for the shingle to seal properly? @Jim F – I don’t know. The manufacturer of your shingles should be able to answer these questions. A couple of years ago I had a roofing company repair some blown off shingles. At that time they performed what they call “wind nailing” on all shingles of the house. This “wind nailing” puts two nails per tab on the bottom of the tab to hold the tab down. All the nail heads are exposed above the shingle. I am now selling the house. I had a home inspection this week and the inspector failed the roof because of this “wind nailing”. With this news I contacted the roofing company and they stated the “wind nailing” is correct and that the inspector doesn’t know what he is talking about. Ed – I’ve never heard of or seen anything called ‘wind nailing’. I’m thinking your home inspector is correct, but it would ultimately come down to the manufacturer’s specs. Find out exactly what shingles you have and get the installation instructions from the manufacturer. If they allow this, no problem. Last week we had our home reshingled. Since then we have noticed that the grain on the shingles is covering our deck and front walkway. Are they faulty?? Linda – probably not. It’s probably just the granules from the roofers walking around on the roof. Clean them up and see if they show up again. They shouldn’t. UPDATE: Contractor will replace removed shingles with new. I have now discovered the rest of the roof has been over nailed, very deeply. Contractor has instructed his “sub” to lift the shingles, row by row, and re nail every bad shingle (which is most of them). This seems an almost impossible task, with an extreme risk of shingle rips, AND will the warranty be valid? Also I now feel I must stay on the roof myself, the entire remainder of the job, to watch the workmanship. I’ve never heard of an entire roof being re-nailed like that either. I agree with you, that seems like an almost impossible task. I think they should just tear the whole thing off and start over. The contractor wants to re-install the same shingles that were removed? I’ve never heard of that being done and wouldn’t recommend it. I bought my house in Sept. 2007. On the disclosure statement the seller wrote new roof shingles 2007. During the past week whole sections of the roof shingles slid down… some shingles fell off the roof. I had a contractor look at the roof. He found that most of the nails had been over-driven. He pulled out whole sections of shingles… no nails in the shingles… nails only in the wood. Is there recourse for this major roofing failure? Hi Carla, that would be a good question for a real estate attorney. what is the remedy for overdriven nails? Can they be repaired, or should the homeowner demand the roof be redone when it fails inspection by the county, as has happened to us today? First inspection showed 5 areas bad out of 6, second inspection showed 3 bad out of 3 areas looked at. We would appreciate your answer to help us decide what to do. Kathy – have the roof redone. My recent experience has been that the insurance company should pay for the repair of the roof or replace the entire roof. If they inspected your roof and have been collecting insurance for it for the past 7 years than they are responsible. It’s their responsibility to perform due diligence, if they failed to do so, that is their problem. I recently had same problem but my insurance company was reputable and did my repair. I don’t recall which web site gave me the information but when I presented this argument to my insurance company they did comply. It may have been this one. I just discovered (7 years after installation) that my entire roof was high nailed. 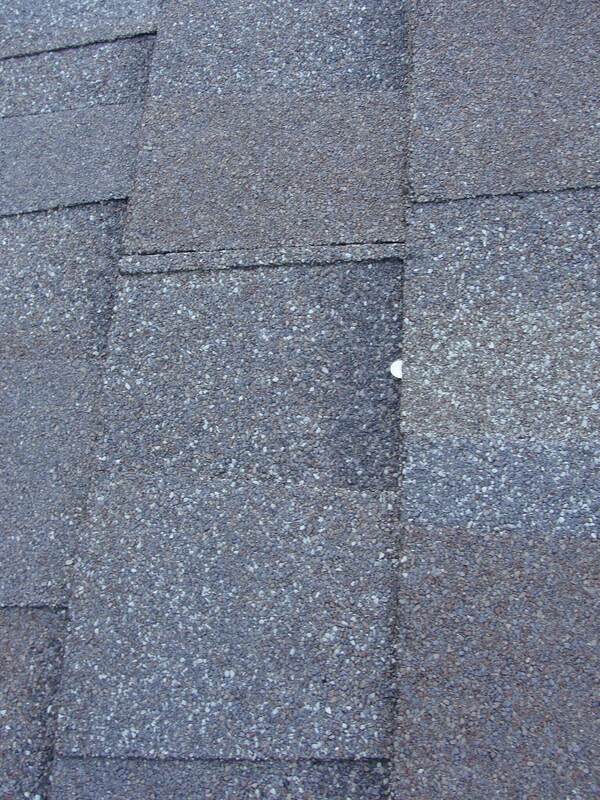 I hired the roofing company to do this work after heavy hail damage in spring 2006. 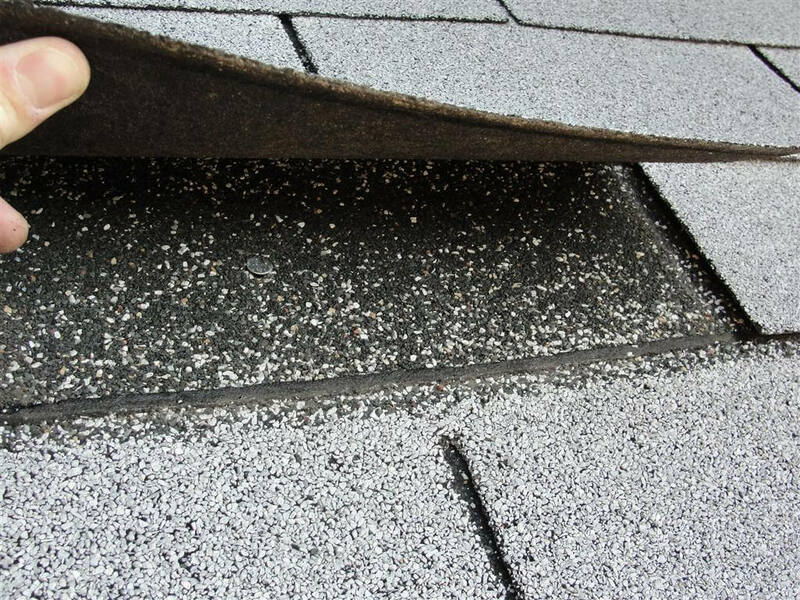 After a wind storm here in TX (Austin area) about 40 shingles blew off and the inspector can stick his foot under the edge of one slope and raise the entire sheet. I’ve called the orig. roofer, and they’ve not called me back. Do I have recourse with the roofer? Would this problem be covered by insurance. I recently had shingles blown off my roof as a result of Sandy. My insurance refuses to pay for a new roof blaming it on improper installation. Probably not. If homeowners insurance covered failure due to improper installations, I believe we would all have to to a lot more in insurance. Cool site. I like the pictures of the decks. A lot of good information. Keep it up. Reuben, very well done post. I think it can be more difficult to “properly” nail shingles with a nail gun than it is worth. 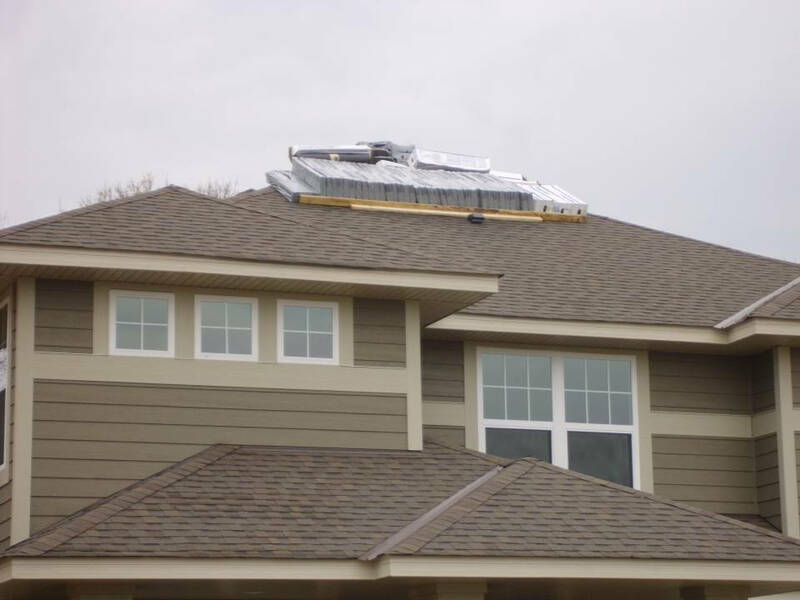 Gun settings, user error, and just plain being in too much of a hurry can make for a very expensive roof if the whole thing has to be done a second time.